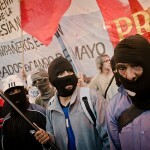 Montoneros, the terrorist group that opened ground for the brutal dictators of the late 1970′s, is reemerging in Argentina. It was seen last Sunday rallying with a large flag that read: “We’re back”. The president of Argentina is setting the stage for another civil war with her extreme left stance and its dire economic effects. Maintaining her position until 2014 will require brutal force. 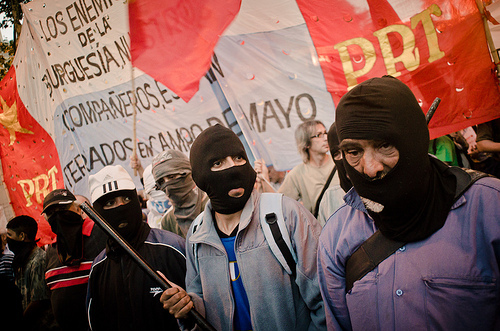 Montoneros is coming back through leftist militant groups such as La Kolina, Movimiento Evita, and La Campora. Alicia Kirchner, former presidents’ sister who was also a staff member during the Videla Dictatorship, is running her presidential campaign via La Kolina. The Kirchners had condemned the military dictatorships but pardoned the terrorists and even gave them high-level positions. 37 years later the same groups with the same people are putting Argentineans against each other for their own political gain, while the economy will be handed with a ribbon to the multinational mega-miners and agribusinesses whether the winners of this civil war is the right or the left.